What if in another galaxy the water is pink and the sky is dark green? The stars glow blue, bronze and white in the endless green sky. What if that entire, tiny, far off galaxy has the color spectrum of early summer peonies here on earth? Some days when I get wrapped up in work and distractions I like to look at something pretty and real. Somewhere a long time ago I read that as a concentration technique you should go outside and look at a tree and think about the tree to help re-focus. Today I looked at a single peony bud and thought about the tiny galaxy of molecules that make up the tiny flower perched in a bottle on my desk. I daydreamed for a few moments, taking in the colors and textures of the flower and then shook my head and finished my tea and got ready for work. When I was dressed and looking in the mirror, I was wearing the colors of that tiny galaxy. That, or I just watch far too much Roswell. You know, I don't know if I have ever seen these colors paired as a focal point before; and especially not so well! Lovely outfit. I adore the feminine skirt and romantic horizontal pleats. that skirt is so pretty and feminine, looking gorgeous! So pretty. Love the skirt! And the bag is awesome! Love this look! The top and skirt are both something I'd love to have in my wardrobe. You look so pretty! I love your skirt + bag!! your skirt is SO gorgeous! is that a recent h&m product? because i love it. your outfit is beautiful, the background is beautiful, your pictures are beautiful... i just love everything about this post! this outfit is very relaxing to look at. i like. This outfit is dreamy. I love the idea of tiny galaxies inside every little thing...it blows my mind when I actually stop and think about the building blocks of everything around us. Very pretty, very feminine. In an alternate universe, I'm normal-sized and cute, and you're big and... still cute. What a beautiful skirt!! I LOVE it! That is the nicest compliment, and thank you for noticing that I re-wear my clothes! Oh man. I loved Roswell! I love that galaxy tote. I love what you wrote here. I loved how it all came together in that you were wearing the colors of the peony galaxy! And of course, your galaxy bag is just the icing on the cake. I am going to have to try out this color combination because its gorgeous! beautiful top! and love that tulle skirt! such a sweet outfit. The colors and textures in this outfit are fabulous, Kal. I love that you look at something "pretty and real" to refocus yourself- I do the same thing. It's incredible the fresh perspective a single peony can give you! this outfit is like a dreamy dreamland i want to live in. you look so lovely. and that is a great way to re-focus. Amazing outfit, Love the colors! I really love these colors mixed together. They look beautiful! 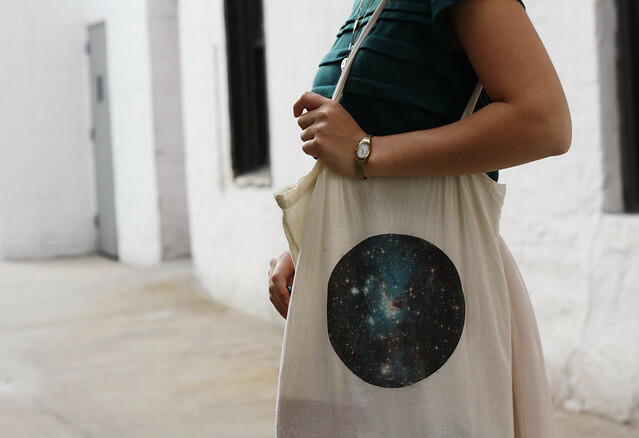 That galaxy tote is fantastic too! I love getting outfit inspiration in strange and new ways. oooh that bag is so perfect! When people don't know what Roswell is I usually freak out and go into fast-talking-chipmunk-mode and demand they add it to their queue in Netflix. ;) SO GLAD someone else likes it!!!!!! !